South Korea’s antitrust regulator slapped a record 1.03 trillion won ($853 million) fine on Qualcomm Inc. for violating antitrust laws, the latest in a string of government actions that threaten the U.S. chipmaker’s most profitable business. The South Korean Fair Trade Commission said Wednesday that the company licensed its key patents only to mobile-phone makers and didn’t properly negotiate the terms of its licenses. The agency also said Qualcomm coerced its customers into signing patent license contracts when selling its chips used in mobile phones in the country, and it also didn’t fairly pay for the use of patents held by other phone makers. The decision from the home country of Samsung Electronics Co. adds to investor concern that the San Diego-based chipmaker, which is also the subject of investigations in the U.S. and Europe, may struggle to defend its lucrative licensing business. Qualcomm gets the majority of profit -- $6.5 billion in its most recent financial year -- from selling the right to use technology that’s fundamental to all modern phone systems. Qualcomm said it will appeal the decision in the Korean courts. The KFTC ruling doesn’t go into effect immediately and Qualcomm will seek a stay from the courts while it appeals, said Don Rosenberg, Qualcomm’s general counsel . For Samsung, the world’s biggest phone maker, and LG Electronics Inc., the ruling opens up the possibility that they may be able to pay lower rates to Qualcomm. When Qualcomm settled an investigation by Chinese regulators last year, it accepted a lower rate charged on phones sold in that country. Samsung is Qualcomm’s second-largest customer, accounting for about 11 percent of its sales, according Bloomberg’s supply chain analysis. Qualcomm also designs and sells chips that are the main component in smartphones. “Qualcomm, a holder of standard-essential patents as well as a monopolistic service provider of modem chips from manufacturing to sales, has violated its agreement to license patents on fair reasonable and non-discriminatory terms, known as FRAND,” the commission said in a statement today. 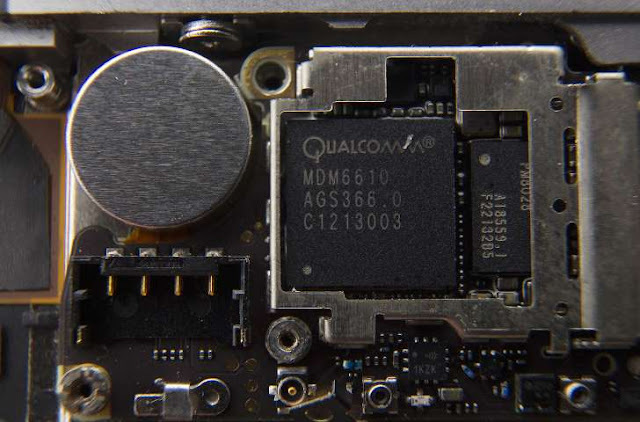 Qualcomm offers the rights to use all of its standard-essential patents, some of which cover the core technology behind modern wireless systems, in a combined package. Some of those inventions are used in industry standards. As in other cases that Qualcomm has won, the company expects the courts to side with it as its licensing business follows industry practices that have been in place for decades, Rosenberg said. Qualcomm’s profits from licensing fees are crucial to funding its industry-leading research and design efforts and maintaining its competitive edge. In 2009, the commission separately fined Qualcomm 260 billion won for deterring competition through discriminatory charges. KFTC ordered the chipmaker to stop charging higher royalties to customers who buy chips from rivals and to cease offering rebates to handset makers who purchase products mainly from Qualcomm. That case is under appeal with the Korea Supreme Court. The U.S. chipmaker has grappled with regulatory challenges around the world. It was fined $975 million last year by China, ending an inquiry that threatened the U.S. company’s growth in the world’s biggest mobile market. The European Commission sent antitrust objections to Qualcomm last December, saying the chipmaker paid “significant amounts” since 2011 to an unidentified major smartphone and tablet manufacturer in return for using Qualcomm’s chipsets exclusively in its products. It may also have sold chipsets below cost from 2009 to 2011 to crush smaller competitor Icera, now owned by Nvidia, the commission added. Resolving patent wrangles remains key to shoring up Qualcomm’s business. Last month, the chipmaker delivered a sales forecast for the December quarter in line with analysts’ estimates, saying it’s managed to sign technology-licensing agreements with smartphone manufacturers in China that had previously held back payments. Qualcomm Inc. said it will fight a ruling by South Korea’s top trade regulator that fined the wireless company $865 million for allegedly violating competition laws with its patent licensing practices. The fine comes after an investigation by the Korea Fair Trade Commission, which appears to want San Diego-based Qualcomm to change “unfair” business practices in the way it licenses its 3G and 4G technology. “Qualcomm has refused to license competing chipset companies while coercing unilateral license terms on handset companies in order to strengthen its monopolistic power in the patent license market and the chipset market,” the commission said. The ruling was a blow to Qualcomm, which called the action unprecedented. The company said regulators were upending patent royalty practices that have been in place for more than two decades worldwide and have benefited South Korean companies including Samsung Group and LG Electronics Inc.
“Qualcomm strongly believes that the Korea Fair Trade Commission findings are inconsistent with the facts, disregard the economic realities of the marketplace and misapply fundamental tenets of competition law,” Don Rosenberg, the company’s general counsel, said in a statement. The company said its patent royalties collected on smartphones sold in South Korea amounted to less than $230 million for its 2016 fiscal year, which ended in September — suggesting that the fine was unreasonable for the size of the Korean market. Qualcomm has been a longtime supplier of smartphone chips to LG and Samsung, the world’s largest seller of smartphones that use the Android operating system. Samsung also manufactures Qualcomm’s Snapdragon chips at its semiconductor factories. Qualcomm makes money not only by designing mobile semiconductors, but also by licensing its vast portfolio of wireless patents on key cellular technology. It charges patent royalties based on the wholesale price of the smartphone. It typically licenses its entire patent portfolio, which includes thousands of diverse wireless patents. South Korean regulators object to Qualcomm’s practice of licensing its entire portfolio, and they say Qualcomm forces firms that buy its semiconductors to also license its patents in violation of South Korea’s competition laws. The commission launched its investigation around the time that China’s top antimonopoly regulator fined Qualcomm $975 million to settle an antitrust investigation. As part of that settlement, Qualcomm agreed to change its patent licensing scheme within China’s borders, basically allowing certain China-only smartphone makers to license patents at a lower royalty rate. Qualcomm offers the same deal to all phone makers worldwide for sales within China. Bernstein Research analyst Stacy Rasgon said this week’s fine was the largest issued by the Korea Fair Trade Commission. In a research note, Rasgon said regulators appear to be demanding that Qualcomm change its business model, including separating out standard essential patents from nonessential patents. In 2010, the same South Korean regulator fined Qualcomm $208 million over its patent licensing practices for 3G technologies. The company paid the fine but appealed. It lost in a lower court and asked the Korea Supreme Court to hear the case. There has been no further action. Qualcomm said it has yet to receive a written order from the Korean commission in this latest dispute. That usually takes four to six months. Once it gets the documents, Qualcomm said, it will seek a stay of the action and appeal both the regulatory findings and the fine to the Seoul High Court. Still, under Korean law Qualcomm must pay the fine within 60 days of getting the written order. It could receive a refund if it wins on appeal. During the investigation, Qualcomm asked a U.S. federal court in San Jose to intervene in the matter. It asked the judge to order Apple Inc., Samsung and other firms to turn over the information about Qualcomm that they shared with the Korea Fair Trade Commission. The company said the commission was not disclosing information as required. “Qualcomm’s repeated requests during the [commission’s] investigation for basic due process rights such as access to case files and the right to cross-examine witnesses were denied,” Rosenberg said. Qualcomm’s shares fell 2.2% on Wednesday to $65.75. South Korean regulators fined Qualcomm $865 million, claiming the chip maker violated the country's competition law. Last year, the Korea Fair Trade Commission accused Qualcomm of unfair practices related to how it licenses its technology. According to Qualcomm, the decision won't become final until a written order is issued, expected in four to six months. In a statement, Qualcomm says it "strongly disagrees" with the penalty. "For decades, Qualcomm has worked hand in hand with Korean companies to foster the growth of the wireless Internet," said Don Rosenberg, Qualcomm's general counsel, in a statement. "Qualcomm’s technology and its business model have helped those companies grow into global leaders in the wireless industry. This decision ignores that win-win relationship." The commission alleges Qualcomm used its dominant position in the modem chip market to force handset makers to pay license fees for a broad set of patents under terms it set unilaterally and to coerce handset makers into signing licensing contracts. The fine, the biggest ever levied by the antitrust regulator, "will restore fair competition in the mobile communications industry," said Shin Young-sun, secretary general at the Fair Trade Commission, during a briefing with reporters. 0 Response to "South Korea fines Qualcomm $853 million"